One case of 500 earphones. Silver Stereo Disposable Earphones allows you to give guests, members, students or customers brand-new headphones for personal audio use. Perfect for schools, fitness centers, spas, gyms, educational use, hospitals, prisons, computer labs, hotels, motor coaches, libraries, rental cars, trains, students, museums and more. 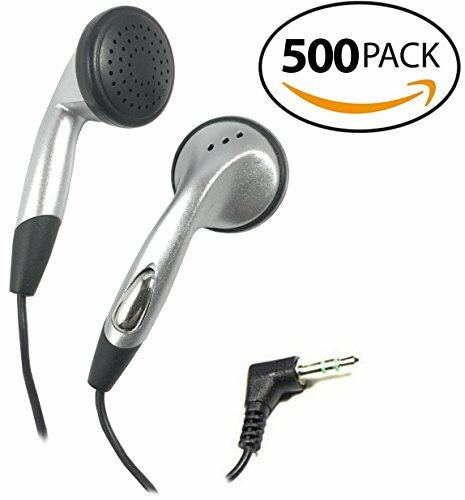 3.5 MM Plug works with iPods, iPhones, iPads, Chromebooks, Tablets, Computers, CD Players, Fitness and Audio Equipment and more. If you have any questions about this product by SmithOutlet, contact us by completing and submitting the form below. If you are looking for a specif part number, please include it with your message.